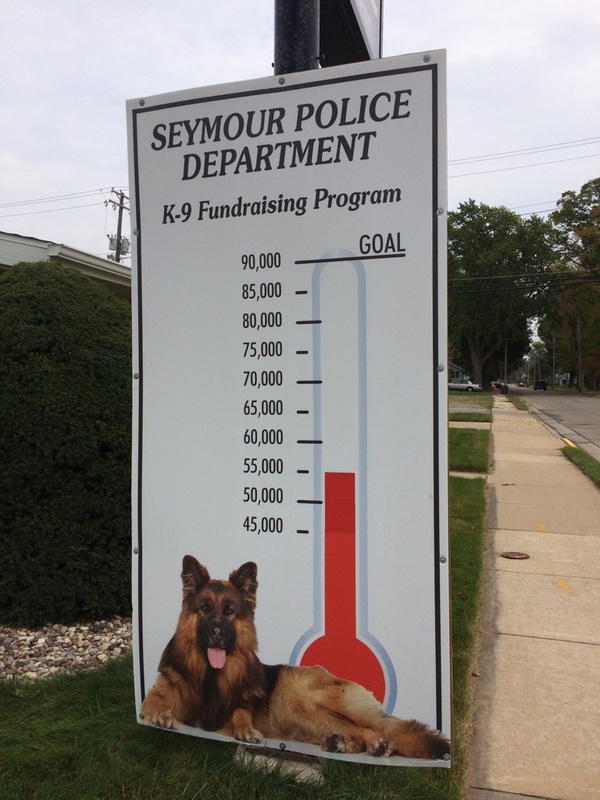 The City of Seymour Police Department is excited to officially announce the start of our fundraising drive for our Police K9 program! This moment has been years in the making and has been preceded by hours of studies, meetings and presentations to city and school leaders. This is the biggest community initiative that our police department has undertaken in recent memory. For this program to get off the ground we will need the help of everyone in our community. This includes all of greater northeastern Outagamie County, as our K9 will be helping to keep our area safe. The first priority of our K9 program will be to provide connectivity with the K9 and our children in our schools, which is why the Seymour Community School District has already made a commitment to be our partner in this initiative. Secondly, our K9 will be dual trained to track suspects and find missing people as well. The K9 will also be available, through existing mutual aid agreements, to help our neighboring agencies when they need K9 services. Up until this point our department has relied on outside help when we needed a K9, so we are looking forward to being able to return the favor. Our target goal for fundraising is $90,000. The biggest expense up front will be purchasing a specialized vehicle to become the K9 unit. The remaining balance of the money will be used to acquire the K9 and send the handler to training. We will also need continued help to provide veterinary care, food and ongoing training for the K9 team. Some partners have already stepped up to the plate to help our program, and in the coming days we will be introducing their initiatives to the public. We are actively seeking the help of every community and civic organization in northeastern Outagamie County (such as fire departments, church groups, social clubs, youth groups, charity groups, etc.). If you are the head of or represent any of these organizations please reach out to us so we can work on fun and original ideas to help meet our fundraising goals. We are also asking for the help of any business, large or small, that can partner with us on this program. Sponsorships are available, and we will be happy to work with your company to spread the word about your support. All donations are tax deductible and a special account has been set up so all donations go directly to K9 program and cannot be used for any other budget item. · Stop by the police station, located at 306 N. Main Street in Seymour from 8:00 AM to 4:00 PM Monday-Friday. 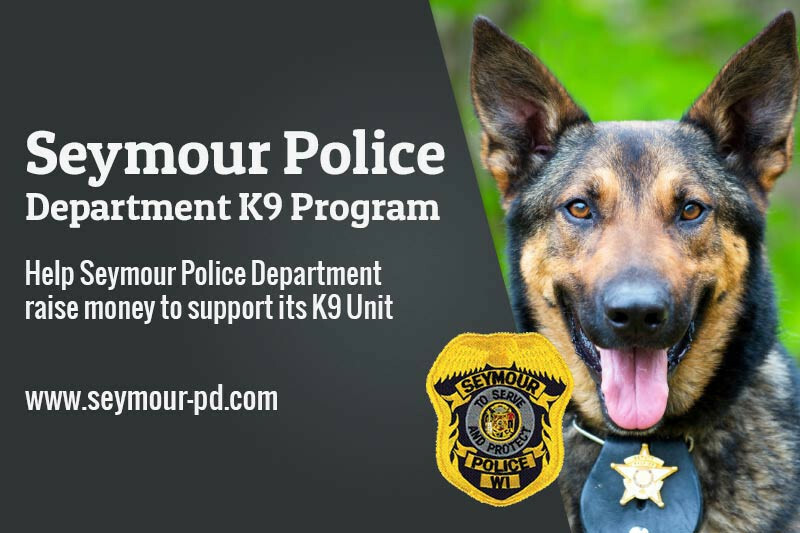 · Mail donations of cash or a check (make checks payable to the Seymour Police Department K9 Unit Donation Fund) to the Seymour Police Department, 306 N. Main Street Seymour, WI 54165. We will send you a receipt for your tax records in the mail. We need your help to make this program a success. It's up to everyone to pull together to make this happen. Because of crime trends and the heroin epidemic this program is now more important now than ever. This program will directly impact the quality of life in our area and will keep our students safe at school. Thank you in advance for your support and please contact us with your ideas or with any questions you have about the program. Our "20 Days. $20,000" fundraising effort was a complete success! We maxed out the $10,000 matching funds and exceeded our goal by almost $7,000! The K9 will be on the job by June of this year. The earliest K9 training class we could schedule begins in late May and the specialized K9 patrol vehicle will take a few months to be delivered and put in service. Stay tuned for more updates about continuing fundraisers for the sustainability of our K9 unit! We are starting our "20 Days $20,000" fundraiser to officially start our K9 program! Help us meet our goal to get the K9 in Seymour by summer! Just a reminder we also have a gofundme page for donations to our K9 program. We will also be announcing a new way to help the program this week! We're hovering at the $60,000 mark!